I took a trip to New Jersey recently to celebrate my sister's birthday and to attend my cousin's wedding all in one weekend. My mother and brother flew in from Tampa, FL around the time my flight arrived into New Jersey. My sister still lives there and my dad was already in town. Of course I wanted to pig out and eat everything I missed...lol. So I did...not everything I wanted, but I did. It was bad of me, but I am back on track again! I enjoyed my time with my sister and other relatives during her birthday celebration. And my cousin's wedding...all I can say is wow! Just beautiful, classy and it matched who she is, elegant. I have a few photos from the wedding on my Instagram which you can view by (clicking here). So much easier, low manipulation, did not use a lot of heat but just to flat iron. I also did hair styles that would not leave too many creases in my hair in order for me to flat iron it easily. As a result, I was able to wear 3 different hair styles for the weekend and use heat just one time! I was so glad I did it that way, otherwise I would have been a mess and would not have time to enjoy myself. I was out late at my sisters event until an undisclosed time and then had to be at the wedding location at 9 am the next morning to assist my cousin (the bride) and the wedding party. I went to the location with the flexi rods and a scarf. I got dressed and took my hair down, finger combed and kept it moving during the time I assisted the bridal party. This is reminder as to why keeping it simple is key. I think when we do go on a trips, or any event we tend to make things so complicated. We also tend to think of doing things that are over the top that will require a lot more "work" to achieve a certain look. I think our goal is to look our best, impeccable and "fly" (yes, it is an old idiom). We can still do that without putting our hair through the ringer or come up with creative ways to come up with that certain "look". How have you tried to keep it simple for an event, during a vacations and/or trip? Did your hair plans change before or during? Or did you make things complicated for yourself and regretted it after the fact? I am curious to know and please share your suggestions! A lot of you are familiar with my daughter, MadiMel who has very coarse hair and the length of her hair is almost down to her waist for her current height. 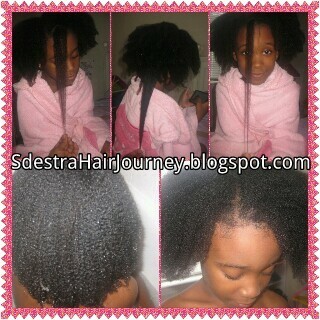 For those of you who did not or do not know, I started my daughter, MadiMel's natural hair journey at the end of 2007. This was when my sister in law told me about Fotki, a photo sharing site, where so many women documented their hair journies and share information. 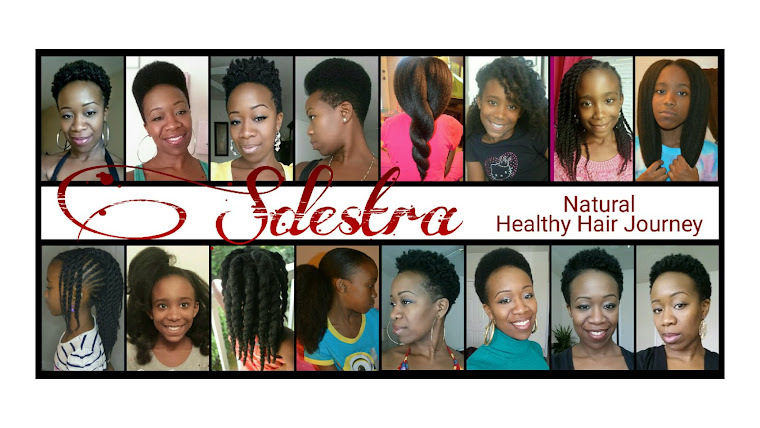 I became fascinated and fell in love with the idea of taking care of our own hairs since I was on my own healthy hair journey. It also meant that I would be saving so much money in the process! Prior to MadiMel's proper hair care routine, I did so many things to her hair that probably would have made her scalp length right now. We are talking about the use of Vaseline, tight rubberbands, hard brushed, bands with metal prongs, etc. But I was left with was dryness and and damaged edges and ends. I was using Johnson & Johnson's baby shampoo to wash her hair. MadiMel was born with a full head of curls and over time they started becoming dry as her true texture starting coming through. At first and prior the major hair care change, I was using Johnson & Johnson's Baby Shampoo. I changed her shampoo while looking at some of the natural sisters regimens on Fotki. Added natural oils to her routine and moisturizers. I started to incorporate healthier techniques....after a while, I noticed that her hair started flourished. I rarely used the rubber bands, I learned a technique to comb her hair, I learned to cornrow and most importantly...I learned more about patience. I always say that if you have patience, you waste less time than if you rushed. I felt that it was also important to start her healthy hair journey too since I was on my own. As she grows and matures, she will in turn learn techniques until she cares for her hair completely on her own. But for now, my stance is to let her see what I do with her hair so she can be armed with knowledge. I will have future posts about her hair journey, techniques and styles! Stay tuned for more of MadiMel beside myself of course! Watch our video I posted today! A few weeks ago I vented talked about how I had gotten so lazy with my hair. I just did not want to or felt like dealing with it at all. We all get like that some times, right? My hair felt as though it needed deep penetrating moisture. It was not dry nor brittle, but it did not feel "normal" for my standards. 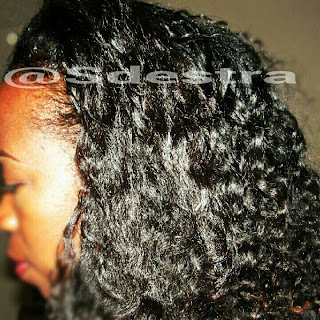 That weekend after my last blog post, I prepooed, washed, deep conditioned and air dried my hair. All I have been doing were protective styles since then: french braid (my fave), bun & braid outs. I have not applied any type of heat to the hair which I will definitely benefit from; thickness and fullness. I have been keeping up with moisturizing especially my hair edges since those areas tend to be the area that deal with a lot of stress. I also have been cowashing like I used to and now my hair feels pretty normal again! Here's a recent photo of a semi failed braid out. One section looked straighter than others...but I made the best of it and brought that to the back of my ear. FAQ: "Should I Relax My Child's Hair?" Please do not copy or use any photos on my blog for any purposes. Thank you!. Powered by Blogger.